Something truly spectacular has been happening in the world of Australian liqueur making lately and I bet you didn’t even know it was going on. It’s a rather wonderful story really, and if you’ve got a few minutes I’d love to tell you all about it… so read on (because at the end you’ll be rewarded with my recipe for Ricotta and Coffee Liqueur Panna Cotta with Candied Walnuts – one of my best dessert recipes yet!). Mr Black is a name I’m sure will soon be on everyones lips. Why? because he is not a person, he is a soon to be launched Australian cold drip coffee liqueur that is quite possibly the best liqueur I’ve ever tasted. We all know about my love affair with Frangelico… well, stand aside my hazelnut love as there’s a new boy in town and he’s super cool – like, James Dean cool. Mr Black is not sickly sugary sweet. Instead, he’s handsome, dark, brooding and intense, and you’ll want to consume him all hours of the day. Trust me, I sipped a shot at 10am on a Sunday morning and I didn’t regret it. Just like the wrapper says it tastes purely of coffee – alcoholic coffee of course. The best thing about Mr Black is that its all Australian made by a boutique distillery. Why is that cool? Because with its office in Sydney and distillery in Erina, Mr Black is the first new spirits brand Sydney has seen. Founded by distiller Phillip Moore and designer Tom Baker, Mr Black was awarded the gold medal at the 2012 International Wine & Spirits Competition in London, the highest accolade ever achieved by an Australian distiller – how cool is that? So, the next question is: “How the hell do I get my hands on Mr Black?”. Well, he’d love your hands all over him. In a world first move by a distiller, Mr Black put himself out there and took the unprecedented step of using Australian crowdfunding platform, Pozible, to launch this flagship product, with supporters having the opportunity to get their hands on a bottle of Mr Black before anyone else. On August 8, with an ambitious target of $10,000 to finance the costs required to fulfil the first order of bottles and coffee, Mr Black began its crowdfunding campaign. As of today (Thursday 29 August 2013) there are 19 days left on the Pozible campaign and the $10K target has been smashed (currently $16,325 is pledged). If you want to join the 188 supporters (it went up 6 supporters in the time it took me to write this post), all you need to do is head over to the Mr Black Pozible Page from now until 17 September, and pledge $50 to get your hands on one of the bottles from the first batch – while you are there, watch the awesome video about how this beauty is made. A plethora of spectacular cocktail recipes spring to mind when thinking about this liqueur, but when Tom got in contact with me and asked me to create a wonderful new dessert using Mr Black, I knew I couldn’t refuse. As an Italian, coffee and desserts go hand in hand. But I was determined not to be cliche – so I knew Tiramisu was off the menu. A few contemplative moments deep in thought and it hit me: I had been thinking of making a ricotta panna cotta for some time, and if I coupled it with the coffee liqueur and some candied nuts, it could be spectacular. This is a must try dessert. When the balance is right, the coffee liqueur and ricotta is like a marriage made in heaven. And with the candied walnuts adding a wonderful texture to the dessert you will be wishing you could have one every night. In a medium sized bowl place ricotta and 1/2 cup milk and mix well. Use a stick blender (or place the ricotta mixture in a stand blender) and blitz until very smooth. Add the coffee liqueur to the mixture, stirring well till incorporated. Set aside. Bring cream, remaining milk, vanilla seeds and sugar to the boil in a saucepan over a medium high heat. The moment the mixture has boiled, remove from the heat. Meanwhile in a shallow bowl, cover the gelatine leaves with water to soften for 5 minutes and once softened, remove the leaves making sure you squeeze out the excess water, then add them to the cream mixture and stir well until all the gelatine has dissolved. Once dissolved, pour the panna cotta mixture through a sieve (to make sure no gelatine remains) and into the ricotta mixture. Stir well till combined and transfer the whole mixture to a pouring jug. Carefully and evenly transfer the mixture to six dariole moulds or ramekins. 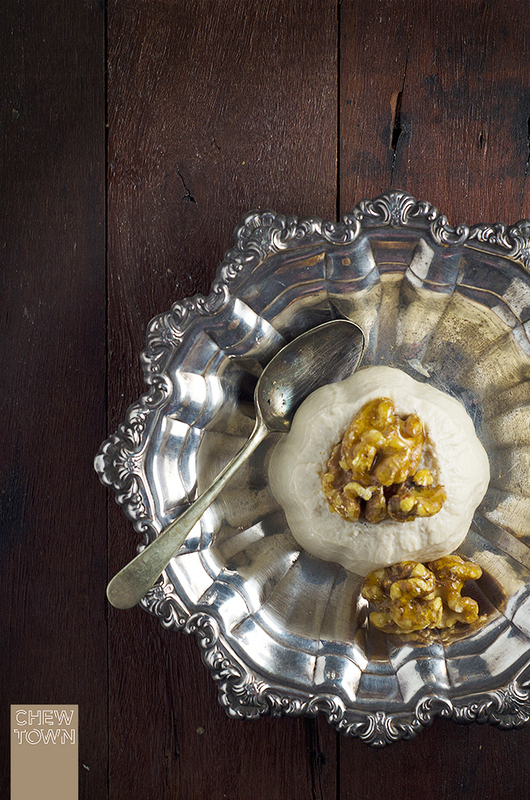 Make the candied walnuts while you are waiting for the panna cotta to set. Place sugar into a medium saucepan and the heat on a medium heat. Stir the sugar with a wooden spoon until the sugar begins to melt. Keep stirring until the sugar has melted and turns a golden colour. Once the sugar is golden, take off the heat and immediately add the walnuts. Working quickly, stir the walnuts until coated in the sugar mixture. Then transfer walnuts from the saucepan to a lined baking tray and separate the walnuts from each other using two forks (as the walnuts will be extremely hot). Set aside to cool then store until you are ready to serve the dessert. Once you have turned out the panna cotta from the moulds, top each dessert with a few candied walnuts. * 2 gelatine leaves results in a very wobbly panna cotta (which I like as I have easy release moulds) if you are planning to turn out your panna cotta you may want to add another 1/2 sheet of gelatine leaves. A big thank you to Tom Baker for allowing me to be one of the select few to try a sample bottle of Mr Black. The full bottles are in such short supply that I was given one tester bottle to keep and a full bottle to shoot and send back to Tom as it was his last full bottle! Oh. My. God. I need to get my hands on some of this. Recent Post: Sunday Spatchcocks with Fragrant Butter and Honey, served with Parsnips and Kipfler Potatoes. I am all over this! Must get my hands on some of it asap because it looks like it’ll be the drink of the summer! very nice photos! now im craving panna cotta! Recent Post: Chinese Roast Pork with Crackling and violence at the dinner table. Oh Amanda this looks all kinds of lovely! ! Im a big pannacotta fan but have not had a lot of luck with making them so far. Will try this out. I’ve seen the Pozible campaign, the liqueur really does look seductive. Nice work on the dessert! beautiful photos! i’ve never seen a panna cotta look so royal! Love Cafe Patron so this sounds right up my alley! Great rim lighting on the bottle in the second picture, highlights on the glasses in the third picture! And great panna cotta, too. Mr. Black looks like some fine stuff. It’ll probably be a bit before it gets to the US, but I’ll be on the look out. I ate the panna. I drank the liqueur. Damn good! Alcoholic coffee is quite an innovation! If coffee alone gives you a kick in your lazy day, how much more if you add alcohol to it. I’m sure consumers are quite interested to take a sip of this new kid on the block.